M-Tech offers the best quality MTUHFI-Long range RFID Card Readers to its clients in India and abroad. 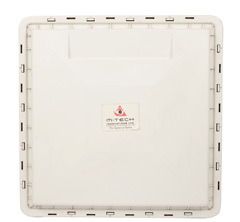 These long range RFID readers are compatible with multi-protocol and have integrated design. This RFID reader solution supports quick and multi-tag reading which adds to its increasing use; furthermore it is water-proof which also proves beneficial for its users. Our long range RFID reader products can be used widely in different RFID systems. The product is a Passive RFID card/tag reader with integrated antenna and weather proof design applied in outdoor. Applications based on long range RFID reader are used for Person, Vehicle Tracking systems etc. These applications can be used upto 12m of distance. Multi person tracking within the area of 12 m from the application. The person need not touch any equipment for being identified. average reading speed 64bits 6ms, 20 Tags/ Second @ 60Km/hr in ideal conditions.